I’ve searched high and low for a homemade brownie recipe that I like as much as the boxed Ghirardelli Double Chocolate Brownie Mix. I’ve tried all sorts of homemade recipes for years and they have never lived up to those boxed brownies. That is until today! I found the BEST from scratch recipe thanks to David Lebovitz! These brownies are dark, oh so dark, rich, moist, and chocolaty. They’re literally a chocolate lovers dream. Be forewarned, they are not your standard cake-like brownie, these are more fudge-like in consistency, but fudge-like in a good way, like a mouthwatering lick your fingers and plate sort of way. Preheat oven to 350 degrees. Line the inside of an 8-inch (I used my 8-inch glass baking dish) or 9-inch square baking pan with 2 lengths of parchment paper, positioning the sheets perpendicular to each other and allowing the excess to extend beyond the edges of the pan. Then lightly butter the foil or parchment paper. I always butter the bottom piece so that the top piece sticks to it. Measure out and chop the chocolate. 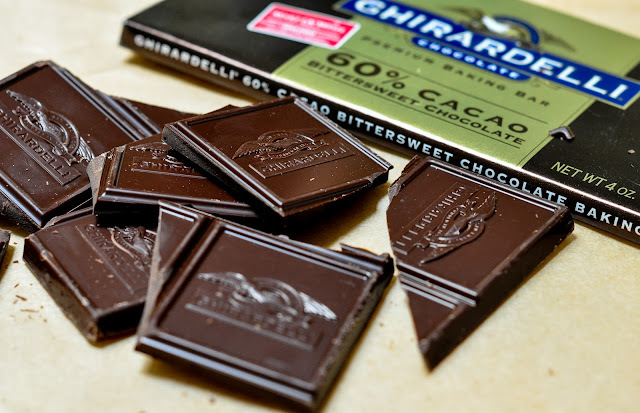 I love using Ghirardelli 60% bittersweet bars because they’re each 4oz (8oz total), so I don’t have to measure anything. These bars are also thin enough to break apart with my hand, so I don’t have to actually chop them up with a knife. I just break them apart into little pieces right over the heatproof bowl that I’m going to melt the butter and chocolate in (I do this before I set the bowl over the simmering water). It actually saves me having to clean up a knife and cutting board. If you don’t have thin chocolate bars like these, then chop up your chocolate using a serrated knife. 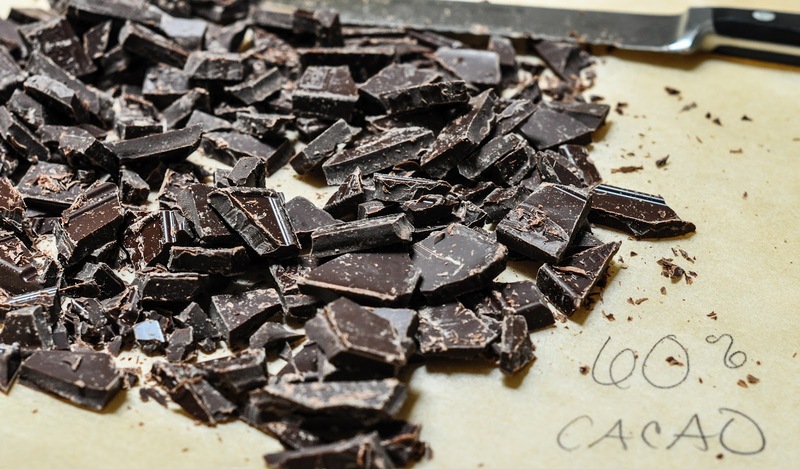 Tip: I always place some parchment paper on top of my cutting board when chopping up chocolate as it helps make clean up easier and you can always just lift and pour those small pieces of chocolate into your pan. It’s easiest to chop chocolate with a serrated knife. Place the chopped chocolate and butter into a heatproof bowl. Set the bowl over a pan of simmering water, (make sure that the bowl doesn’t touch the water) and melt the butter and chocolate together, stirring constantly with a rubber spatula, until melted and smooth. Immediately remove the chocolate from the heat and pour the chocolate mixture into a large bowl (unless the bowl you’re using to melt the chocolate in is large). Make sure you use a spatula here so you can get all the chocolate goodness into the bowl. Add the 3/4 cup sugar and the 1 teaspoon vanilla to the melted chocolate and mix until combined. Note: I used coconut sugar, and it’s brown in color, not white like normal sugar. Add the flour and stir the batter energetically for 1 minute until the batter loses it graininess, becomes smooth and glossy, and pulls away a bit from the sides of the bowl. The batter will also lighten up a bit in color. Note: This is a very important step!! Make sure that your stir vigorously for 1 full minute or a bit more. I suggest timing yourself. By doing this step you will end up with a batter that’s rich, thick, satiny smooth, and glossy, and the brownies as a result will be rich and fudge-like. See, I really timed myself. I’m going to warn you that you are going to have one tired arm after stirring vigorously for a minute, believe me! Scrape the batter into the prepared pan using a spatula to make it even. You can even top it with some coarse sea salt. Bake until the center feels almost set and the edges are a bit firm, about 30-35 minutes. Do not over bake. In my oven, my brownies are done around 32-33 minutes. Note: Ovens vary in temperature and baking times, so get to know your oven and know how long it takes to bake things. If your oven tends to cook things faster, then check it before 30 minutes etc. The first time I baked these, I honestly thought they were underdone, but that is the way they are supposed to be. They’re truly more of a fudge-like brownie than cake-like one. They will also firm up as they sit and cool. Let the brownies cool completely in the pan (about an hour or so) before lifting the parchment paper and the block of brownies out of the pan. Storage: Wrap the brownies up tightly in the parchment paper and then with a layer of tin foil, or store them in a sealed container. It’s best to cut the brownies right before serving them, as they stay fresher that way. See how rich and gooey they are? Serve these up with a tall glass of milk and make sure you have a napkin handy. These brownies are finger and plate licking good! I’ve made these brownies gluten-free and they taste exactly the same as the original version! Yippee! Check them out! I’ve made these brownies better by adding carmel and sea salt. You have to try these salted caramel brownies. I love taking these brownies to a party paired with my favorite chocolate chip cookies! You can’t go wrong with either of these desserts! These brownies are the bomb and just as easy to make as any boxed variety! They are chocolatey and fudgey, a brownie lovers dream! Measure out and chop up the chocolate. Tip: I always place some parchment paper on top of my cutting board when chopping up chocolate as it helps make clean up easier and you can always just lift and pour those small pieces of chocolate into your pan. It's easiest to chop chocolate with a serrated knife. Place the chopped chocolate and butter into a heatproof bowl. Set the bowl over a pan of simmering water, (make sure that the bowl doesn’t touch the water) and melt the butter and chocolate together, stirring constantly with a rubber spatula, until melted and smooth. Immediately remove the chocolate from the heat and pour the chocolate mixture into a large bowl (unless the bowl you're using to melt the chocolate in is large enough). 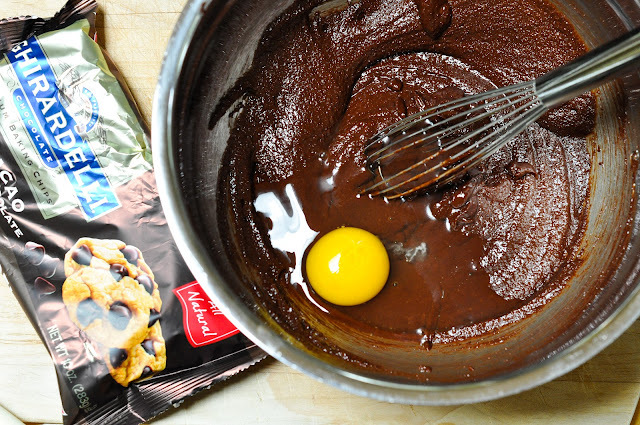 Make sure you use a spatula here so you can get all the chocolate goodness into the bowl. 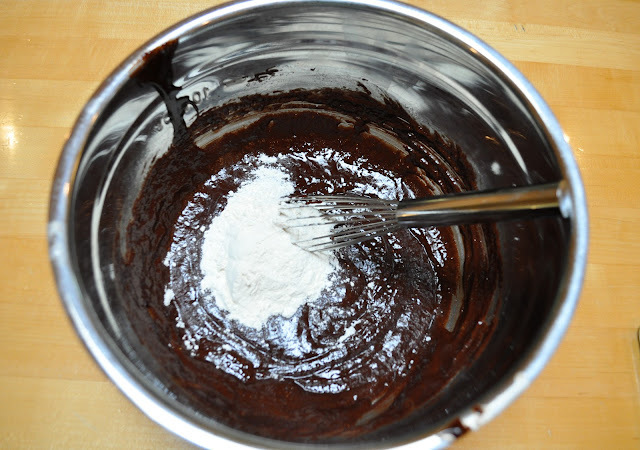 Add the ¾ cup sugar and the 1 teaspoon vanilla to the melted chocolate and mix until combined. Add the flour and stir the batter energetically for 1 minute until the batter loses it graininess, becomes smooth and glossy, and pulls away a bit from the sides of the bowl. The batter will also lighten up a bit in color. Note: This is a very important step!! Make sure that your stir vigorously for 1 full minute or a bit more. I suggest timing yourself. By doing this step you will end up with a batter that’s rich, thick, satiny smooth, and glossy, and the brownies as a result will be rich and fudge-like. Scrape the batter into the prepared pan using a spatula to make it even. Bake until the center feels almost set and the edges are a bit firm, about 30-35 minutes. In my oven, my brownies are done around 32-33 minutes. Do not over bake. The first time I baked these, I honestly thought they were underdone, but that is the way they are supposed to be. They're truly more of a fudge-like brownie than cake-like one. They will also firm up as they sit and cool. Storage: Wrap the brownies up in the parchment paper and then wrap them tightly up in tin foil. It's best to cut the brownies right before serving, as they stay fresher that way. These are the best brownies I have ever made! People always ask for the recipe. I’ve made them with a good quality milk chocolate as well and they were fabulous too. I find my oven cooks them in 28 minutes. I know, not 30 but 28 and they are to die for. Thanks for such an amazing recipe. When you see it written out, it looks daunting but I actually make it in one bowl and it is really easy. I have also been searching for a recipe that tastes like Ghiradelli Chocolate Chip brownie mix. While your recipe sounds very delicious, there has to be a way to make them that doesn’t involve melting chocolate and is more like the mix. If ANBODY knows, I’d be forever grateful! I don’t like melting chocolate, either. However, It worked to break the choc bars into their pre-marked squares, butter into tablespoon chunks, all in a Pyrex bowl in the microwave for 2 min. I stirred at 1 min 30. Easy melting job! I never comment, but I made these and they are now my go-to brownie recipe. They are easily as delicious as Ghiradelli brownies. I made these and they were DELICIOUS! Thank you so much for this recipe. Bookmarked! Thanks for commenting and letting me know that you made and loved them. I just made the boxed Ghirardelli the other day because I was short on time, and they don’t compare at all to these brownies. Ghirardelli brownies are to cakey for me now! My kids and hubby feel the same! Anyway, I’m glad you loved the brownies. Yaay! I’m so glad you loved them. They truly are the best homemade brownie recipe I have found. Thanks for letting me know how they turned out for you! these look amazing! i’ve been researching these david/roberts absolute best brownies and yours are by far the best looking i’ve seen so far (& also the only that has added chocolate chips i think, which i think is brilliant by the way). did you use an 8 inch or 9 inch pan? Thanks so much for the sweet compliment! I’m psyched the photo enticed you to visit the blog. It’s funny because my kids are having as sleepover tonight and it was a toss up between these brownies and our favorite chocolate chip cookies. The chocolate chip cookies won because I only had one 4oz bar of chocolate in the house! I used and 8×8 square glass baking dish. I will note that in the above post. I think David used a 9″ dish for his brownies, so it really doesn’t matter, just use what you have. I only have an 8″ so I used that. Let me know if you make them and how they turn out for you. Remember to stir the batter vigorously for 1 minute, as that is a very important step! That’s so funny – for *years* I have been searching for a brownie recipe comparable to the Ghiradelli Double Chocolate Brownie Mix. Clearly, I must make these immediately. Thanks for sharing! So fudgy, my boyfriend would melt at the sight of these! Thanks for stopping by Jesica. These are super fudgy but in a good way. I hope your boyfriend enjoys these. Thanks Averie and Pam! Averie, it’s a compliment coming from you as you are the baker extraordinaire! I love an uber dense, rich, fudgy gooey brownie. and also that it was adapted from David L.
They look so rich, decadent and perfect – yum!